First a Murder Charge, Now Corruption - What Next Governor Obado? The High Court has unfrozen one of the accounts believed to be a proxy used by Migori Governor Okoth Obado to siphon over Sh2 billion through manipulation of the county's procurement system. Anti-corruption court judge Hedwig Ong'udi ordered that an account operated by businessman Ernest Omondi be freed after nearly seven months of being iced. The alleged Obado proxies had separately filed applications seeking unfreezing of their bank accounts. Rulings on the other applications are still pending before Justice Ong'udi. Other respondents in the suit are Jared Oluoch Kwaga, Joram Opala Otieno, Patroba Ochanda Otieno, Hellen Adhiambo Odie, Beatrice Akinyi Ogutu, Kennedy Odhiambo Akello, Janto Construction, Marowa Stores, and Mbingo Enterprises. Despite its accounts being frozen, Janto Construction was awarded a road repair tender in March this year. County officials proceeded to release Sh16.8 million to the firm. 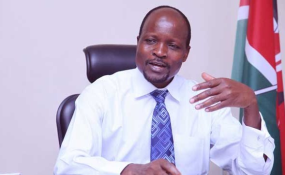 EACC detectives have unearthed 32 companies they say Mr Obado used as proxies for procurement, and 77 pieces of land and other assets that were bought using proceeds of the scheme. Justice Ong'udi had in June ordered that the anti-graft watchdog increases the number of officers combing through bank accounts frozen to ensure speedy conclusion of the investigations. Detectives say that through the procurement scam, Mr Obado was able to build a home worth Sh100 million and send Sh13 million to his children in Australia and Scotland. The embattled governor sent Sh1.9 million to his daughter Susan at the University of Aberdeen in December 2014 through Mr Kwaga. In August 2016, Mr Obado sent Sh12.2 million to his son Dan Achola Okoth in Sydney, Australia, through Mr Opala. Investigations into Migori County's procurement processes began in September last year.